New census data released last week shows that more Americans are commuting by bike than ever before--but that the total numbers, even in the biggest biking cities, are still a paltry percentage of total commuters. According to the U.S. Census Bureau’s American Community Survey, 0.62% of commutes were made by bicycle in 2013, a small increase from the year before. This percentage equated to an estimated total 882,000 people who considered themselves bike commuters. In the city that had the highest percentage of bike commuters--Portland, Oregon--only 5.9% of people got to work by bike. The list of cities with the higher percentage of bike commuters, compiled by the League of American Bicyclists based on the census data, shows some surprises. New Orleans (No. 5, 3.6%), Houston (No. 34, 0.8%), and Pittsburgh (No. 11, 2.2%) all saw biggest jumps in bike commuting since the previous year. Minneapolis, in snowy, cold Minnesota, is impressively ranked No. 4, with 3.7% of its commuters hopping on a bike. The machine-washable shorts contain sensors to measure electrical activity in leg muscles and monitor athletes’ heart rates, muscle load balance, and other critical factors. A phone-sized clip-on device logs sensor readings and sends them to a smartphoneapp via Bluetooth for real-time audio coaching during workouts. The Mbody shorts are based on technology the company already offers to pro athletes and training centers, but the Mbody Coach app is a new product. Through a Kickstarter campaignlaunched this week, Myontechopes to bring its smart shorts and an accompanying real-time audio coaching smartphone app to the running and cycling public. Over 50 percent of reported bike crashes that occurred on Commonwealth Avenue in Boston during a four-year stretch involved a bicyclist being hit or coming in contact with a car while riding in the designated bike lane. There were 100 bike crashes reported on the entirety of one of Boston's busiest stretches, the stretch of Comm Ave flanked by Boston University, between 2009 and 2012. In the area between Packard's Corner and West of the BU Bridge alone – an area currently targeted for multi-million dollar reconstruction project – 58 crashes occurred; the top cause of reported crashes involved motorists unknowingly cutting off bikers while making a right turn at an intersection, while the second highest percentage of bike crashes was "dooring" – bikers slamming into recently swung-open car doors. Paul Schimek, an independent researcher and author of a new bike injuries study, describes how over half of these bike crashes happened: "Cyclists were riding in the bike lane and were "struck by a suddenly opened car door or by a motorist turning right across the bike lane." In reported incidents, about 30 percent of bicyclists escaped with only minor or no injuries, and did not require treatment by emergency medical services; moreover, only 26 percent of bikers treated in emergency rooms, Schimek found, citing state Department of Public Health data pertaining to Boston, and even for the more serious cases, where the bicyclist was admitted to a hospital overnight, only 40 percent had been in a collision with a motor vehicle. 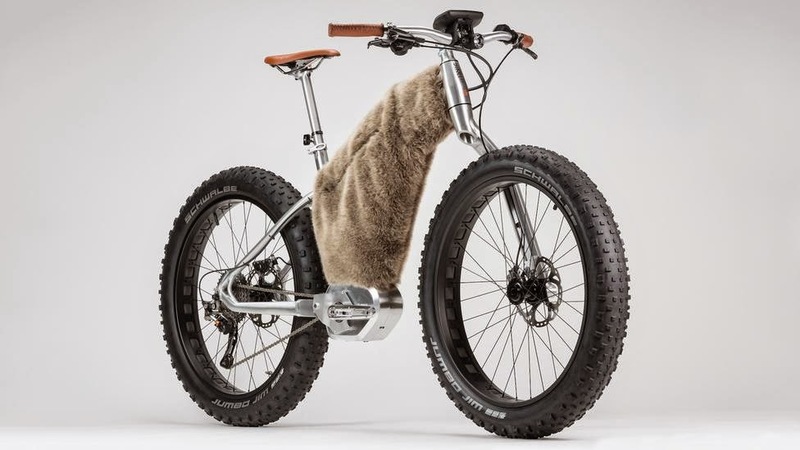 The multi-gifted French designer Philippe Starck has unveiled four specialised bicycles for four uniquely demanding environments. Starck’s MASS collection (that’s Mud, Asphalt, Sand and Snow), broke cover on 27 August at Germany’s Eurobike 2014 bicycle trade fair. Along with the bikes, the collection includes a range of complementary gear — colour-coordinated helmets, gloves, glasses and backpacks. The stylish two-wheelers, created in collaboration with French cycle-maker Moustache Bikes, include electric-motor assist systems and a laundry list of high-end components, and each incorporates features intended to help the rider conquer its respective namesake environment. Said Starck: "I wanted the bike to be able to go over all kinds of terrains and especially infinite and poetic territories." Johannes Pistrol rides the Steinerne Rinne from Goinger Halt, July 2014. The upper section from the summit down to the upper rinne is relatively straight forward, albeit slightly exposed. The lower section contains the hardest and the most futuristic riding. Johannes didn't clear all sections but this attempt is the most I have seen ridden so far. Since the original Pamir "Hypercracker" went out of production a couple of years ago, there has been no small, portable tool available that would allow on-the-road cassette removal. Such a tool is of vital importance to the touring cyclist, because it's the only way to be able to replace a broken spoke on the right side of the rear wheel, the most common spot for spokes to break. Although this tool is a bit more expensive than the original Hypercracker, it is lighter, smaller and made with more precision. San Francisco and Chicago are experimenting with a simple design innovation, common in Europe, that subtly separates cyclists from road traffic. A smarter and safer type of separated bike lane that’s common in cycle-friendly European cities like Amsterdam and Copenhagen is now beginning to make its way to the United States. Street planners already widely recognize that rather than simply painting a line on the road, physically separating bike lanes from car traffic provides a safer biking experience and increases the appeal of two-wheeled transportation. So far, in the U.S., this has taken the form of building protected bike lanes, which usually involves using bollards or barriers or building the lane between parked cars and the curb. But these methods aren’t always ideal. Some people consider barriers ugly, and protecting lanes behind parked cars can make it harder for drivers who are turning right to see a cyclist. They can also confuse pedestrians and be harder to drain or clear snow from. Raised bike lanes offer cyclists vertical separation from the road without these problems. They are usually elevated just a few inches above the street level to prevent cars from crossing over, but are below the sidewalk to demarcate the lane from regular pedestrian traffic. They offer a dedicated space for cyclists, but can be less expensive to build than other kinds of lanes when there’s new road construction anyway. San Francisco will be getting its first raised bikeway next year. It will only be one-block long--part of a “showcase” project in the Mission neighborhood--but the city is planning to build more of them as part of other upcoming street improvements projects that will take place in the next few years. Chicago has also been building its first raised bikeway this summer. Smaller cities including several in Oregon have already implemented the infrastructure. While we’re still hoping that one day our "raised" bike lanes are built far above street traffic, like this bright orange skyway planned for Copenhagen, at least the U.S. is starting to mimic some of Europe’s most sensible design innovations. WITH SEATYLOCK, CYCLISTS WON'T HAVE TO LUG HEAVY BIKE LOCKS AROUND, CAN'T FORGET THEM AT HOME, AND WON'T GET THEIR SEATS STOLEN. Designing a perfect bike lock is an ongoing challenge: The toughest of locks are usually heavy and bulky, a pain to transport, and easily forgotten at home. And many locks, while securing the frame, leave individual bike parts, like the seat or the front wheel, vulnerable to thieves. Seatylock, a new design currently being funded on Kickstarter, aims to solve these problems. Designed by Oren Livne and Michael Shenkerman, Seatylock looks deceptively like a normal bicycle saddle, but a three-foot steel chain lock folds into it. 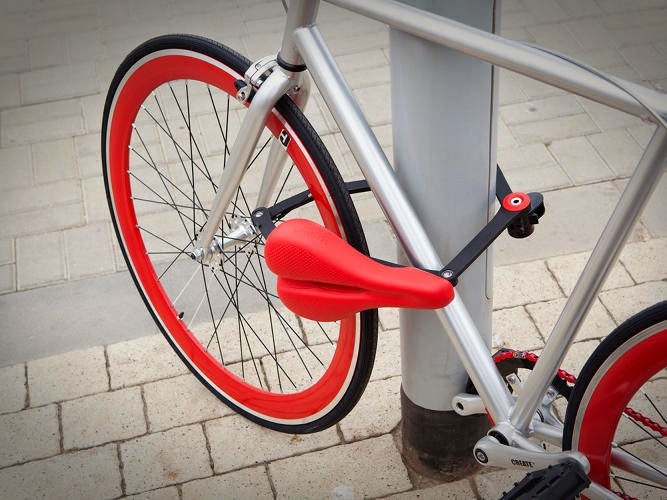 When you take the seat off its post, the lock comes out, and it takes 30 seconds to secure your bike frame and seat to any pole or fixed object. A universal adaptor means it’s compatible with any standard bike--it’s as easy as replacing your bike saddle--and can adjust to your preferred seat position. 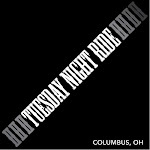 And it will be available in a range of colors for cyclists who like to turn their rides into fashion statements. Seatylock comes from the designers of Foldylock, a--you guessed it--folding lock that that's rust free and easy to carry in your backpack or strapped to your bike frame. According to Popular Mechanics, it's able to withstand even the most ambitious bike thief. Seatylock is currently funding on Kickstarter, starting at $75, and is available in a cushiony “comfort” model and a slimmer “trekking” model. If the project is fully funded, it’s estimated to ship out in March 2015. We rode from Hostel Detroit to Roosevelt Park to the ride start. We finished the metric century route with lunch at Michigan Central Station. Great day in the saddle! On Friday afternoon we rode from Hostel Detroit to lunch at SLOWS BAR BQ. Then visited Lafayette Greens, The Heidelberg Project, Dequindre Cut and stopped for a beer at Atwater Brewery. Late dinner at Cadieux Cafe. Is the bike lane a boy’s club? Elizabeth Plank, senior editor at Mic, reveals a significant gender gap, with far fewer women cycling than men, for a number of reasons: “Women’s aversion to risk, women’s clothing, economic and time poverty, as well as sexual harassment,” she writes. German, Danish and Dutch women cycle as often as men but the numbers are much different in North America. In Canada, just 29 per cent of daily bike commuters were women, according to 2006 census data, although that number did rise in Canadian cities: women made up 35 per cent of bicycle commuters in Toronto and Montreal and 37 per cent in Vancouver. “The concern for riding in street traffic is No. 1,” Bike New York’s operations director Emilia Crottytold the New York Times in 2011. “Then it’s ‘I don’t want to be sweaty.’ ”In New York, male cyclists outnumbered female cyclists 3 to 1 in 2011; that gender gap widened in neighbourhoods where car traffic is heavier. According to Women Bike, an organization that works to encourage more female bicyclists in the United States, women accounted for just 24 per cent of bicycle trips in 2009. And in London, 77 per cent of cycling commuters are men, with 75 per cent of women saying they find it too dangerous to cycle.